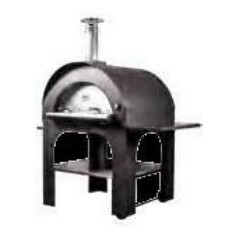 All outdoor fired burning ovens are made with specials materials able to resist in every atmospheric condition, from rain to sun. Cooking chamber in stainless steel 430 and painted steel roof. A very strong insulation with 8 cm of wool-rock between the roof and the cooking chamber and double insulation with 2.5 cm of ceramic fiber and 3 cm of wool-rock under a refractory stone of 3 cm. 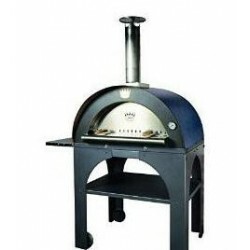 OUTDOOR PIZZA OVENS There are 7 products. It is possible to reach the temperature of 400°C in 15/20 minutes. Quick cooking time, 2 minutes for pizza. 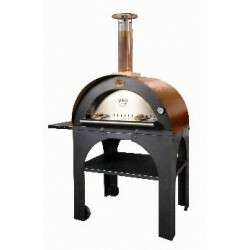 New patented air system “AIR PLUS” sending air on wood with the result of cooking Pizza perfectly on both sides. It is possible to reach the temperature of 400°C in 15/20 minutes. 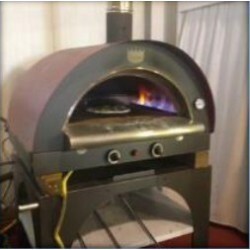 Quick cooking time, 2 minutes for pizza. 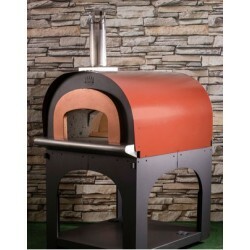 Direct wood fired oven in refractory 1975 Round cooking surface: diameter 80 cm. 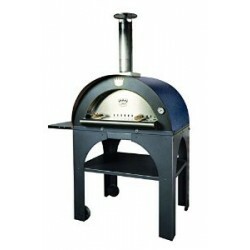 Cooking capacity: 5 pizzas.Weight: 275 kg. On wheels.